Tech2morrow is create and delivering web based applications, that are both outstanding and extremely reliable, can help take up your current needs, to meet your future needs as well. We provide cost-effective, efficient solutions for all your business technology needs. 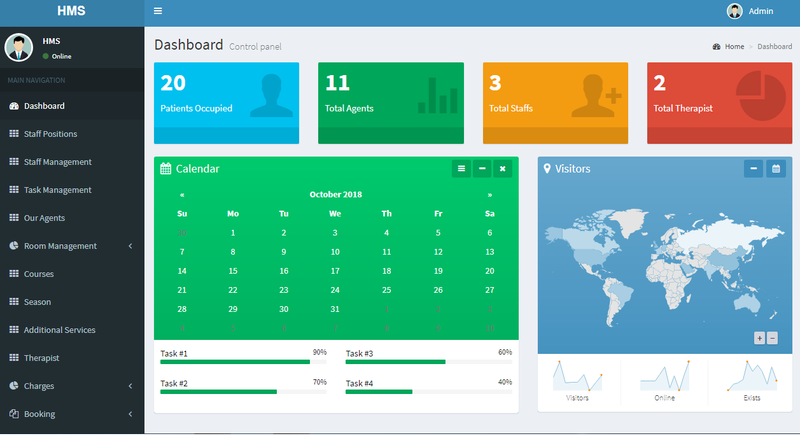 Guest Management System (GMS) is a web-based state-of-the-art product covering all aspects guest management of small, medium and large-scale resorts / ayurveda centres. Our Guest Management system is a streamline recordkeeping, includes guest registration management, agent administration, season management, room management and billing functions. The physician has instant access to guest information / case sheet and a reliable method for updating information’s, noting medications and other important data’s. Accurate billing and bookkeeping keeps the practice running smoothly. PMS (Pharmacy Management System) will meet the end-to-end operational requirements to provide comprehensive pharmacy services. PMS Browser based software deployed on your Local Area Network or the Cloud as per your need, maintained solution that eliminates much of the cost and end user maintenance for an enterprise pharmacy solution. PMS is committed to developing to minimize initial infrastructure outlay and to maximize support needs. We see ourselves helping our customers to accelerate the growth of their businesses through the application of innovative technology. Our goal is to help you get your products to market faster and both scalability and high performance.